When you have 2 people working full time in the house, eating out can become a easy solution. Then you realize that half of one paycheck goes towards meals that you can make at home. Personally, I would rather take a little time and make the effort to eat at home. I’d like to buy a house someday. I think that’s a bit more important than the ease of eating out. Another bonus is that I know what we are putting in our bodies. I’m not too happy knowing how much crap we put in our bodies, so I had to give in and give this a try. 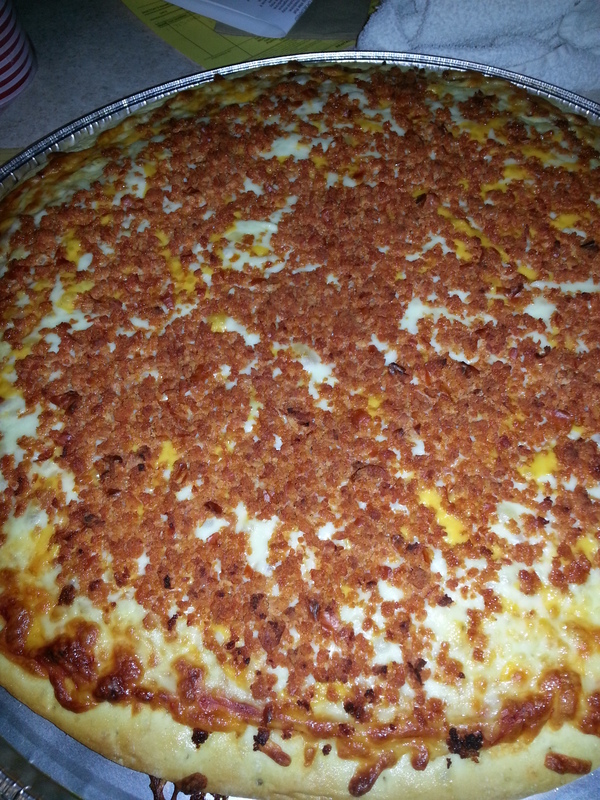 Growing up in Massachusetts Krista and I LOVED linguica pizza. It’s a Portuguese sausage that we grew up on. I never knew you couldn’t buy it everywhere. Until I moved to Iowa ;( . Thankfully we can still order it and have it shipped! It can be pricey which is why we use it sparingly, and grinding some up for pizza makes a little bit go a long delicious way! If you haven’t tried it, you really should. It is amazing. Great with just about anything. http://www.famousfoods.com/linguica.html is where we have found the best price. Shipping is killer because you have to get 2-3 day shipping since it is a food product. I cannot say enough how much it is worth it! I will also share a few more recipes that we use it in just so you will get good use out of it. Combine the water, yeast, honey and 3 tablespoons of olive oil in the bowl of an electric mixer fitted with a dough hook. When the yeast is dissolved, let stand for 10 minutes to let the yeast activate. Once the yeast is foamy, add 3 cups of flour, then 2 teaspoons salt, and mix on medium-low speed. While mixing, add up to 1 more cup of flour, or just enough to make a soft dough. Knead the dough for about 10 minutes until smooth, sprinkling it with the flour as necessary to keep it from sticking to the bowl. Once the dough has risen, punch it down and separate into 2 large, 3 medium or 6 single size pizzas. Place your dough on pizza pans with parchment paper. I don’t use a recipe for the sauce, whatever I have on hand works. Usually its leftover spaghetti sauce. Sprinkle mozzarella cheese on top. How much you use is really up to you. Some like tons of sauce and cheese, some don’t. Since you are making it at home, you can have it any way you want! 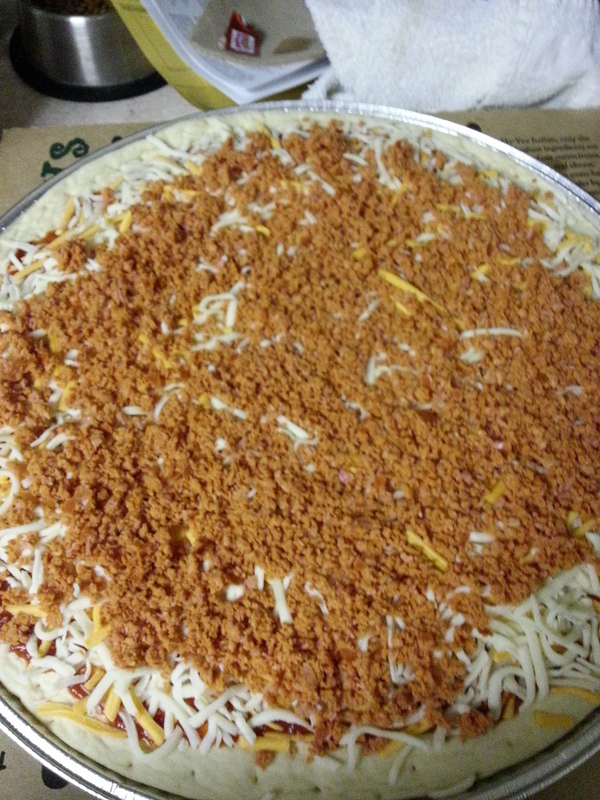 If you purchased your linguica ground then you can just sprinkle it on top. If you bought the links, you can run it through the food processor or slice it like pepperoni and put it on that way. Bake 25-30 min or until cheese is melted and slightly brown. Enjoy!! I did get the dough recipe from http://www.foodnetwork.com/recipes/ina-garten/white-pizzas-with-arugula-recipe2.html#! You are of course welcome to try the toppings from her post, but in my house, we don’t get to try those things. My fiance is way too picky! Either way, I hope you enjoy the pizza and let me know how you like the linguica! !